Inspired by action figures and toys from his youth, Stelios Mousarris’ designed a new coffee table that combines the carefree spirit of childhood, with just really cool design. Five retro-style wooden rockets are caught mid-launch, seeming to propel upward from 3D printed bulbous exhaust bases. 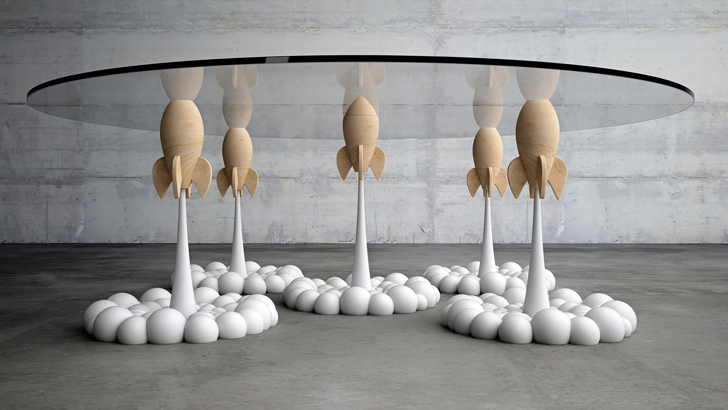 The best part of The Rocket Coffee Table is that it is totally customizable, enabling parents to top their rocket base with a kid-friendly surface until they’ve grown. We also love that as a long-time collector of nostalgic toys and action figures, Mousarris upcycled his collectibles to create this stellar piece. The Cyprus-based furniture designer used vintage rockets from his personal collection as the base for a fun and fresh design that puts an exciting jolt in the modern coffee table. The five sculptural rockets are made from a combination of traditional and modern design practices. 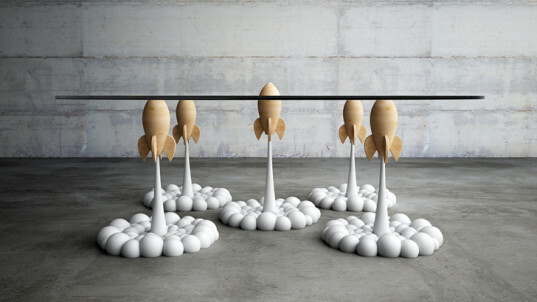 The rounded wooden rockets are made from hand-carved wood, and the enigmatic cloud-like supports are made from traditional resin casting and 3D printing, anchoring the piece both in nostalgia and futurism. Together, the five rockets securely hold a glass table top, the central rocket designed to poke through a hole to keep the surface in place. Since the rockets are not attached to the glass, Mousarris allows for a bit of personal customization. Buyers can fit the rocket tops with a soft-edged material, or even affordable plywood that can withstand the wear and tear of little ones, then be replaced when they’re grown.